As President Barack Obama has toured the country in a recent push for a criminal justice overhaul, he’s worried publicly about the possibility of his daughters’ teenage rebellion. He’s mused about his own drug use as a wayward youth. He’s told stories of being pulled over for speeding — and not always deserving the ticket. In the national conversation about crime and punishment, Obama hasn’t been afraid to identify with the people being policed, as well as with the police. It’s a remarkable shift in tone after decades of politicians worrying more about being labeled soft on crime than too hard on criminals. Previous presidents have talked tough on the topic and heaped praise on police. They’ve rarely woven in personal encounters with the law. 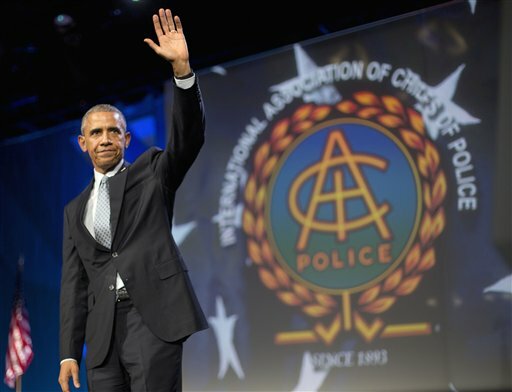 Obama, speaking to police chiefs in Chicago last week, praised police for their work but also called for “serious and robust debate over fairness in law enforcement.” He used himself as an example. Such comments stand out from the history of presidential rhetoric in part because of Obama’s place in that presidential history. Questions of racial bias in the criminal justice system are not merely academic for him, noted Marc Mauer, executive director of the Sentencing Project, a group that advocates for sentencing reform. “He’s the first African-American president and his life experiences are different than others. He’s lived it — directly or indirectly — more than other presidents have. The empathy is there,” Mauer said. But Obama’s comments also reflect the moment, Mauer noted. The current political conversation about crime, justice, race and violence in America largely has been driven by a course correction. A push to overhaul sentencing laws has bipartisan support in Congress. Violent images of police have sparked outrage about racism and use of force in policing. All of this is playing out while crime rates overall are down. The contrast is stark from the conversation in the late 1980s, when Massachusetts Gov. Michael Dukakis, the Democratic nominee for president, was pounded by ads all but blaming him for the crimes of Willie Horton, a convicted murderer who raped a woman while out on a weekend furlough. By 1994, President Bill Clinton was pushing for “the toughest crime bill in history” in his State of the Union address, and urging Congress to help him “reclaim our streets from violent crime and drugs and gangs.” Clinton referenced his days as Arkansas attorney general to boost his bona fides on the issue. Obama isn’t facing re-election, which allows him to venture into a political danger zone. He was the first sitting president to visit a federal prison, where he sat with a handful of inmates and discussed their beefs with the system. He planned a visit Monday to Newark, New Jersey, to focus on efforts by formerly jailed people to re-enter society. At a recent town hall meeting on drug abuse, he raised his own history of drug use and mentioned his 14- and 17-year-old daughters. At each of these events, which are aimed at keeping pressure on Congress to pass reform legislation, Obama notes the role of race in law enforcement. Obama’s remarks haven’t gone unnoticed by his political opponents — and may still affect his party’s bid to hold the White House. New Jersey Gov. Chris Christie raised Obama’s remarks to police last week at the GOP primary debate.